He's stepping out and living large -- and hoping someone else will grab the check! 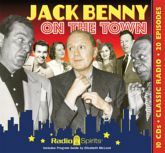 That's Jack Benny, living the high life with a galaxy of guest stars in this hilarious collection of twenty digitally restored and remastered episodes. Jack moved in a glamorous world during his long residence in Hollywood, seen at all the right nightspots and hobnobbing at premieres with all the right people - like Van Johnson, Fred Allen, Portland Hoffa, Tyrone Power�and Dennis' mother. Go out on the town with Jack, Mary Livingstone, Phil Harris, Eddie "Rochester" Anderson, Dennis Day, and Don Wilson!